This information is part of the Modelica Standard Library maintained by the Modelica Association. 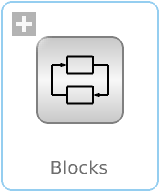 This library contains input/output blocks to build up block diagrams. Copyright © 1998-2016, Modelica Association and DLR. This Modelica package is free software and the use is completely at your own risk; it can be redistributed and/or modified under the terms of the Modelica License 2. For license conditions (including the disclaimer of warranty) see Modelica.UsersGuide.ModelicaLicense2 or visit https://www.modelica.org/licenses/ModelicaLicense2.